I am a big fan of biographies/autobiographies/memoirs. I guess that's the journalist in me, and why I love doing interviews and learning about why people open a business or play in a band. I've also really gotten into historical fiction lately--anything like The Book Thief and Water for Elephants. 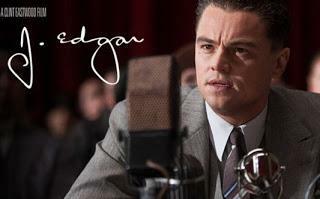 Anyway, I really enjoyed J. Edgar because I had no idea about his life and shaping of the FBI. But, I also liked the emotional analysis of this complicated, conflicted man played solidly by the always great Leonardo DiCaprio. I felt most strongly for Armie Hammer's character, who was in love with J. Edgar and as a result was at Edgar's mercy professionally and personally. Edgar was portrayed somewhat like the repressed cowboy Heath Ledger played in Brokeback Mountain. The emotional turmoil and self-loathing seeped from DiCaprio and gave a thorough glimpse into Edgar's life. It dragged at some points, and I definitely got angry at Edgar's treatment of Clyde Tolson for all those years, while denying him a real relationship. His bossiness, control freak-ness, and undercurrent of anger are palpable, and Tolson just puts up with it, even after having a debilitating stroke. A touching learning experience that is the best example of how history can be told--sometimes best--by the analysis of one person's worldview.